Data migration has become a mandatory and regular activity for most data centers. Companies need to migrate data not only when technology needs to be replaced, but also for consolidation, load balancing, and disaster recovery. 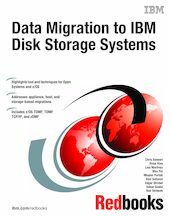 This IBM Redbooks® publication addresses the aspects of data migration efforts while focusing on the IBM System Storage® as the target system. Data migration is a critical and complex operation, and this book provides the phases and steps to ensure a smooth migration. Topics range from planning and preparation to execution and validation. The book also reviews products and describes available IBM data migration services offerings. It explains, from a generic standpoint, the appliance-based, storage-based, and host-based techniques that can be used to accomplish the migration. Each method is explained including the use of the various products and techniques with different migration scenarios and various operating system platforms. This document targets storage administrators, storage network administrators, system designers, architects, and IT professionals who design, administer or plan data migrations in large data Centers. The aim is to ensure that you are aware of the current thinking, methods, tools, and products that IBM can make available to you. These items are provided to ensure a data migration process that is as efficient and problem-free as possible. The material presented in this book was developed with versions of the referenced products as of June 2011.